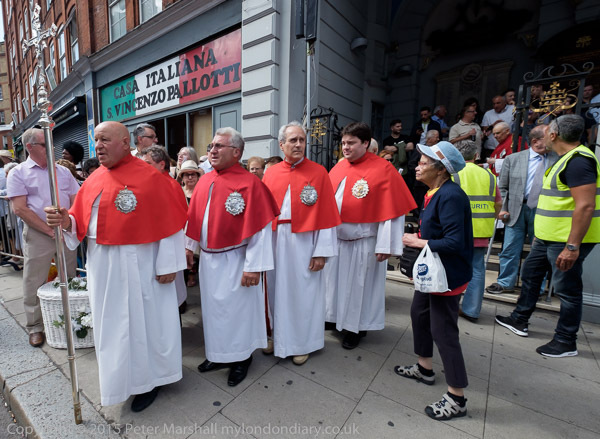 I can’t remember when I first photographed the annual Italian Church festival in London, one of our older traditions, dating back to when the community around the church in Clerkenwell was given special permission to hold a procession around their parish in 1883. Then a Roman Catholic procession was politically still very sensitive. The Popery Act of 1698 had tightened the very strict limitations on Catholics, putting a bounty 0f £100 on Catholic priests and providing for the “perpetuall Imprisonment” at the discretion of the King of priests taking Mass or anyone found to have been educating youths as Catholics. When the Papists Act of 1778 attempted to reduce this official discrimination London saw its worst riots ever with around 50,000 people taking part in angry marches to Parliament, with ‘King Mob’ attacking the homes of wealthy Catholics, embassies of Catholic countries and prisons – both Newgate and the Clink were largely destroyed – and other targets in and around the city. It was riot on a scale that makes our current protests look small beer indeed – with just the occasional window being broken, the occasional and possibly sacrificial police vehicle torched and where cereal being thrown at a shop window makes vicious headlines. After around 5 days of mob rule the army were brought in, shooting and killing almost 300. Around 450 people were arrested and later around 30 of them were tried and executed. The legal discrimination against Catholics (and Protestant dissenters) was reduced by Acts in the 1820s but was only finally removed by the Religious Disabilities Act of 1846. But of course we continue to celebrate ‘Bonfire Night’ on November 5th, though perhaps few of us now remember it as an anti-Catholic event dating from 1605, and by Act of Parliament until 1859. 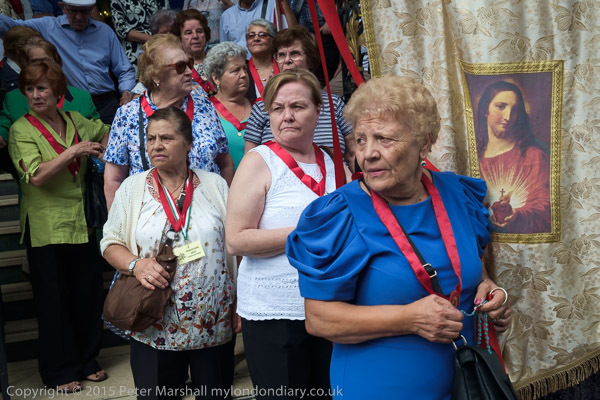 It was one of my photographer friends whose father was Italian who first told me about the procession of Our Lady of Mount Carmel and I arranged to meet him there perhaps around 20 years ago, and I’ve met him again there most years since then, taking pictures and sharing a few tumblers of Italian wine in the Sangra. 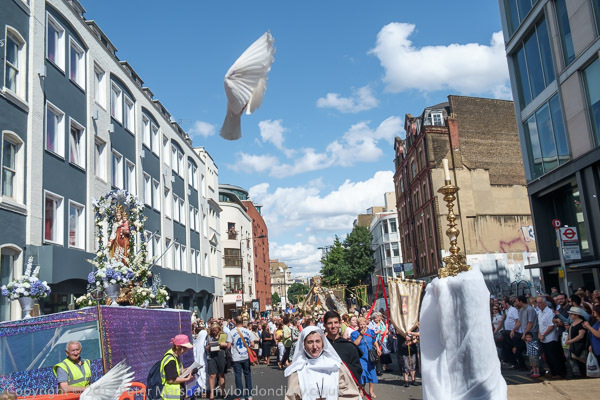 One of the highlights of the event has always been the release of doves, and it’s something I make a point of trying to photograph. It changes a little from year to year and in most recent years I’ve been lucky in getting one decent image of it. This year I had taken with me two Fuji cameras, the X-E1 and the X-T1, and most of the time I had the Fuji 10-24mm zoom on the X-T1 and the 18-55mm zoom on the X-T1. There were two releases of three doves, and I’d got in a good position for the first one and was waiting with the X-T1, and I set the shutter to continuous high-speed mode – 8 frames a second. As the lid to the first basket was raised, I raised the camera to my eye in readiness and the electronic viewfinder remained blank. I just had time to grab the X-E1 and raise it to my eye and get a single image as the birds flew away. But they doves were not co-operating – one was flying low and mainly out of frame, a second was nicely in frame but performing a pancake impression, while the third had soared way up and behind me by the time I pressed the shutter. I saw a second basket and knew I had another chance later. So I checked the X-T1 again and found that the battery had run out – you get little or no warning. I changed the battery for a fresh one – I’d carefully taken 5 spare batteries with me and had checked before going out that all were fully charged . I tested the high-speed continuous mode with a short burst. Everything was fine. 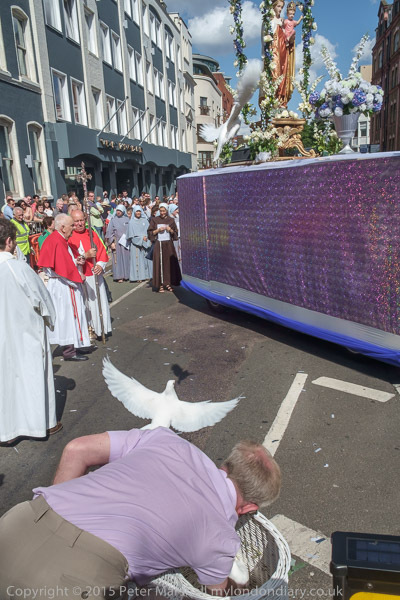 But as the dove man got ready to raise the lid of the basket, I put the camera to my eye and … Nothing. The viewfinder was blank. I tried the usual way to unblock the Fuji sulk, switching the camera off, then on. It still didn’t respond. Fortunately the doves were on a go-slow. They were sitting happily in the basket and having a good time, refusing to leave. I had time to lift the X-E1, adjust the zoom to 18mm and make a picture as the doves were persuaded to leave. You can see all three of them in the image – one still in the basket and two in flight (and a small black shadow dove as a minor bonus.) It certainly wasn’t the best picture I’ve made of the release, but at least I had a picture. I don’t know why the X-T1 let me down that second time, but it illustrates well the frustration I have with what is in other respects a fine camera – with some really great lenses. It’s the same with other Fuji cameras too, though today for once the X-E1 performed without similar hiccoughs. I keep hoping that Fuji will sort out the problems in the next firmware update, but I suspect they are too basic. This entry was posted on Friday, November 20th, 2015 at 06:29 pm and is filed under My Own Work, Photo Issues, Political Issues. You can follow any responses to this entry through the RSS 2.0 feed. You can leave a response, or trackback from your own site. The Privy Council no less. Goes back to Henry VIII. We still suffer from having the C of E as our established religion. I’d not seen the BBC piece before. Illustrates how little committed those who govern us are to ‘Freedom of Information’. So many things they still want to keep secret.